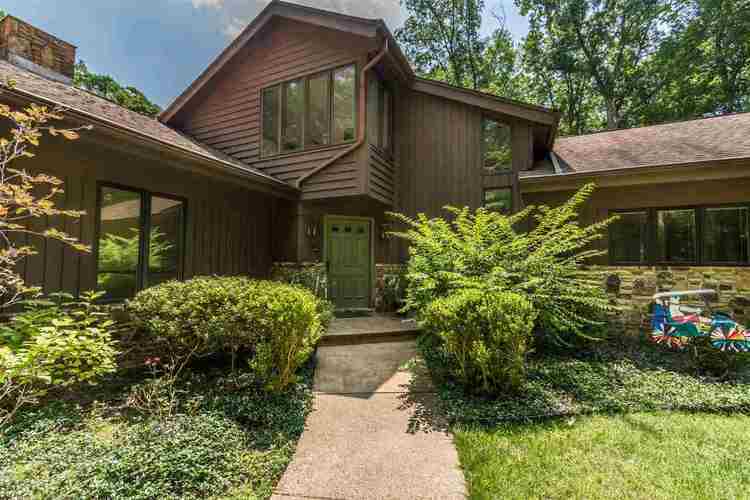 This stunning cedar mid-century contemporary is positioned perfectly on a five acre wooded site on Bloomington's east side. This custom home has a split bedroom configuration with a master suite wing, a beautiful living room and dining room combination with access to the screened deck system, a family room with stone fireplace adjacent to the large gathering kitchen with walk-in pantry and a sun room with views of the mature trees and waterfall. The secondary bedrooms are generously scaled and share two full baths and a dedicated laundry room. The clever design of this home has extra walk-in storage and wisely accommodates for the most ambitious needs. The custom nature of this home is evident with the private upper level study with attractive views and an additional access to immense attic storage. Other custom touches are the three car garage with access for basement storage, a lower level workshop with dog washing facility, cedar closets, Pella windows, built-in bookcases, spa room with sauna and hot tub, and a tasteful swimming pool with gorgeous natural surroundings. The lower level with walk-out to the pool is perfect for entertaining with a wet bar, stone fireplace, recreation room, media space, walk-in storage and spa area. This home provides a wonderful lifestyle near Indiana University access, College Mall and conveniences in a park like setting in Kingston Estates. Directions:East state road 46 to Kings Road to James Road. Home is last house on the right.